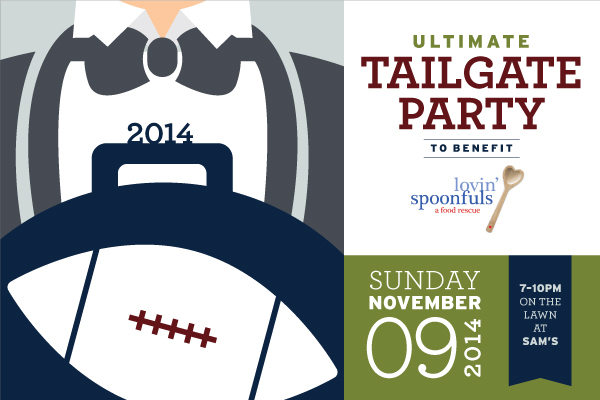 Tickets Now on Sale for the 4th Annual Ultimate Tailgate Party! On Sunday, November 9th, 2014, Lovin’ Spoonfuls will host the fourth annual Ultimate Tailgate Party and celebrate our upcoming 5th anniversary, all while overlooking Boston’s scenic waterfront at Sam’s. The annual event, sponsored by Bank of America and the John W. Henry Family Foundation, and hosted by Esti & Drew Parsons, co-owners of Sam’s, features 16 of Boston’s “MVP” chefs cooking high-end versions of their favorite tailgate food, a silent auction, entertainment and much more. Beer, wine, and cocktails will be shaken and served by Sam’s own Jon Parsons and Nick Korn of OFFSITE. This year, we are thrilled to honor founding Culinary Board members Joanne Chang and Christopher Myers during the VIP hour, for their continued support of our work. As Chef + Owner of Flour Bakery & Cafe, Joanne has become a nationally renowned author, and together with her husband, celebrated restauranteur Christopher, they own and operate Myers + Chang, the acclaimed South End restaurant. Christopher and Joanne are beacons for the charities they support and ingrained in the fabric of the Boston community. The VIP hour also features sparkling wine, cheeses from Wasik’s Cheese Shop, and charcuterie from Josh Smith of New England Charcuterie. The theme of the event resonates the ‘Spoonfuls mission: combatting hunger is a team sport! This year an all-star team of Boston’s premiere chefs will once again join the party by cooking their own creative takes on their favorite tailgate food. Guests will be able to enjoy creative comfort food from Lovin’ Spoonfuls culinary board members Jamie Bissonnette (Coppa and Toro), Joanne Chang (Myers + Chang and Flour Bakery), and newest culinary board member Michael Scelfo (Alden & Harlow), as well as Karen Akunowicz (Myers + Chang), Asia Mei (Sam’s at Louis Boston), Colin Lynch (Menton, No. 9 Park), Louis DiBiccari (Tavern Road), Matthew Gaudet (West Bridge), Will Gilson (Puritan & Co.), Tiffani Faison (Sweet Cheeks), Daniel Bojorquez (La Brasa), Jason Cheek (Merrill & Co.), Steve Postal (Commonwealth), Christine & Carla Pallotta (Nebo), Jason Albus (Fairsted Kitchen), the team from Mei Mei Street Kitchen, and Keith Pooler (Bergamot). Full details and TICKETS are available here!